Each weekend, Bob Gaughan wraps up the college football action with an eye towards the next class of quarterbacks and the UB Bulls. Notre Dame and Penn State made statements last night that they were right in the mix for the college football playoff. The Irish blew out USC 49-14. It started with a strip sack of Sam Darnold and there was no looking back. ND’s only loss was by one point to a powerful Georgia team. ND’s offensive combination of QB Brandon Wimbush and RB Josh Adams is tough to stop. The Irish have a tough schedule remaining but if they win out their in the final four for sure. Penn State got revenge on Michigan. 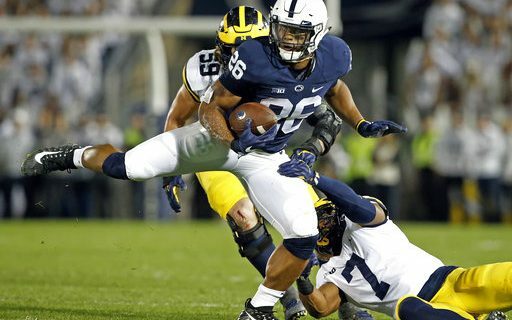 Michigan destroyed Penn State last year in Ann Arbor and PSU returned the favor with a 42-13 win in Happy Valley. Give Saquon Barkley the Hesiman right now. He looks like the best back in the country. He had 161 combined yards and three TD’s against the tough Michigan defense. Next week Penn State takes on Ohio State. Lamar Jackson First QB Taken? Earlier this week, a CBS sports draftnik had Lamar Jackson the first QB taken in his NFL mock draft. This might not be wrong. With the struggles of the other QB’s in the class, it seems Jackson continues to impress each week. Against a good Florida State defense, Jackson combined for 334 yards of offense and two touchdowns. He led Louisville to a hard fought 31-28 victory. The wheels are falling off at Florida State. FSU came into the year as a final four candidate, now they are 2-4. OUCH! If Oklahoma State lost to Texas, the loss would have hung totally on the playing calling of the mullet head coach, Mike Gundy. OSU pulled out a 13-10 OT victory. Texas dared OSU to run and Gundy took the bait. It’s one thing if it’s working. The high-flying OSU offense was held to 10 points in regulation. Gundy ran the ball 51 times and threw 38. He has Mason Rudolph and James Washington, the best QB-WR duo in the country. It was bizarre. Rudolph was held under 300 yards passing for the first time this year. He threw for 282 yards but I blame Gundy more than Rudolph for the poor offensive showing. Baker Mayfield led the Oklahoma Sooners to a come-from-behind 42-35 win over a good Kansas State team. The Sooners were down 21-10 at the half. Mayfield threw for 410 yards and accounted for four TD’s on the day. The Sooners weakness is their defense. Kansas State was held to 216 yards last week against TCU. They had 202 yards in the first quarter against the poor Sooners defense. *Kansas was held to a record low 21 yards of offense in a 43-0 loss at TCU. At halftime the score was 24-0 and the yards in the game were 305-3. *David Sills had three more touchdowns catches for West Virginia, that hung on for a 38-36 victory over winless Baylor. Sills has 15 TD receptions on the season, that’s six more than anyone else in the country. *Josh Allen had another poor night against a good team. He had 131 passing yards and two picks in a 24-14 loss to Boise State. Allen doesn’t have much help around him. He was the team’s leading rusher with 62 yards. *Luke Falk bounced back after a dismal performance last week in Cal. Falk threw three TD passes in the rain as Washington State shutout Colorado 28-0. *Josh Rosen threw for 266 yards in UCLA’s win over Oregon 31-14. Check out UCLA’s Bolu Olorunfunmi’s hurdle into the end zone. True Freshman QB Kyle Vantrease made his first start of his career on the road in Miami-Ohio. The Bulls couldn’t overcome a slow first quarter start. Miami jumped out to a quick 10-0 lead and won the game 24-14. The Redhawks loaded the box and forced the Bulls to win on the arm of Vantrease. Vantrease was 17 of 41 for 202 yards and 2 TD’s. This was kind of a typical start for a true freshman on the road in his first start. Tyree Jackson was dressed for the game and the hope in the locker room was he would start next week in Akron. The Bulls are 3-5 on the season and need to win three of their next four to become bowl eligible. Bob Gaughan recaps the college football weekend every Sunday on Buffalo Sports Page. For more from Bob, visit his authors section.